Fluid sensors find applications in nearly every manufacturing and processing industry. For instance, the oil and gas industry utilizes fluid sensors for their hydraulic and lubricating oil reservoirs, storage tank level monitoring, and wall-head automation, whereas food and beverage applications of fluid sensors includes beverage dispensing, coffee making, and food warming. The industries pertaining to chemical, power generation, and water and waste water treatment are some of the other primary end users of fluid sensors and the prosperity of each of these industries is reflecting positively on the market for fluid sensors. According to this business and commerce study, the demand in the global fluid sensors market will increment at a notable CAGR of 5.6% during the forecast period of 2017 to 2025. The analysts of the report have estimated that the global fluid sensors market will be worth US$18,026.8 mn by the end of 2025. Apart from the prosperity of various industries that fluid sensors cater to, the market for the same is gaining traction from recent technological advancements. Resilient research and development by the companies of the fluid sensors market has resulted in energy efficient fluid sensors that are equally accurate and reliable, and hence are gaining adoption. The advent of digital sensors and smart sensors has enabled two-way communication as well as self-diagnosis. The increasing usage of micro-electro-mechanical systems (MEMS) as a contact-less type technology for the monitoring of water usage and capacity in commercial, residential, and industrial measurement application is also expected to reflect positively on the global fluid sensors market in the near future. Based on product type, the fluid sensors market has been segmented into pressure sensors, temperature sensors, flow sensors, and level sensors. In 2016, in terms of revenue, pressure sensors provided for the maximum demand, which can be attributed to increasing application areas of various pressure sensing techniques across different end use industry. However, temperature sensors segment is expected to grow significantly too during the forecast period 2017 to 2025. In terms of end use industry, the global fluid sensors market has been bifurcated into oil & gas, chemical, power generation, food & beverages, and water and wastewater treatment. In 2017, the oil & gas industry contributed to the largest market share in terms of volume. Additionally, the demand from the oil & gas industry is expected to expand at the highest CAGR during the forecast period. In the near future, adoption of fluid sensors is expected to increase in application areas such as fluid and gases pressure control and temperature control. This reason is subsequently expected to drive the demand for fluid sensors across industries such as chemical, food & beverages, and water & waste water treatment. 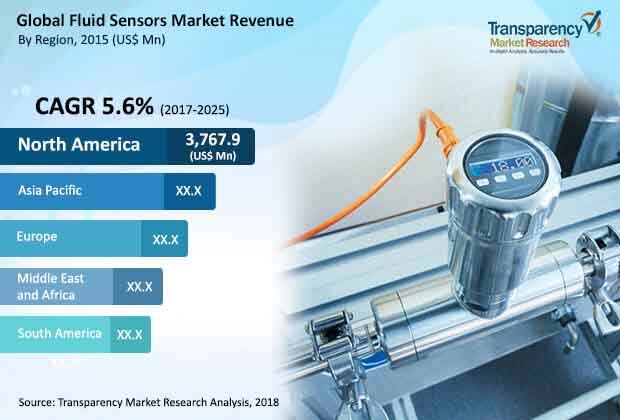 In 2015, North America was the most lucrative regional market for fluid sensors, providing for a demand that translated into a revenue of US$3,767.9 mn. However, while the North America fluid sensors market is anticipated to hold onto its leading position until 2025 while providing for a demand worth of US$6,587.1 mn, the Asia Pacific fluids sensors market is poised to reach a valuation of US$US$6,016.3 mn by 2025, expanding at an above average CAGR of 6.2% during the forecast period of 2017 to 2025. The surge in demand for fluids sensors from APAC is owing to the growing usage of fluid sensors in various industry infrastructure development such as oil & gas, chemical, food & beverages, and others, particularly in the emerging economies of China, India, and Japan. NXP Semiconductor, SICK AG, Honeywell Corporation, Schneider Electric AG, BOSCH, Gems Sensors, Inc., Yokogawa Electric Corporation, and General Electric Company are some of the key companies operating in the global fluid sensors market. This report on the global fluid sensors market provides analysis for the period 2015-2025, wherein 2016 is the base year and the period from 2017 to 2025 is the forecast period. Data for 2015 has been included as historical information. The report covers market dynamics including drivers, restraints opportunities, and trends expected to influence the global fluid sensors market growth during the forecast period. Product type (such as pressure sensors, temperature sensors, flow sensors and level sensors) are playing a major role in driving the global fluid sensors market have also been covered in the report. The study provides a comprehensive analysis on market growth throughout the above mentioned forecast period in terms of revenue and volume estimates (in US$ Mn and Thousand Units), across different geographies. Sensing fluid levels is critical to automating systems and protecting equipment. The primary use of fluid sensors is to control the temperature, pressure and flow of various types of fluids such as liquid, gas and plasma. Market watchers are forecasting continued, explosive growth in the fluid sensors business. Increasing the demand of pressure and level sensing techniques across the different industry vertical is predicted massive growth will be driven of fluid sensors in coming years. The fluid sensors market has been segmented on the basis of product type, detection medium, measurement type, end-use industry and region. On the basis of product type, the market is segmented into pressure sensor, temperature sensors, flow sensor and level sensor. Based on detection medium, the fluid sensors market has been bifurcated into various type such as liquid, gas and plasma. In addition, the fluid sensors market is bifurcated on the basis of measurement type into contact and non-contact. Based on end-use industry fluid sensors market has been compartmentalized into various segments such as oil & gas, chemical, power generation, food & beverages, water & waste water treatment. Geographically, the global fluid sensors market is divided into North America, Europe, Asia-Pacific, Middle East and Africa and South America. We have analyzed the regions in terms of revenue (US$ Million) and volume (Thousand Units). Region wise prominent countries covered in the report include the following – the U.S., Canada, Germany, U.K., France, China, Japan, India, GCC, South Africa and Brazil. Furthermore, the study also includes quantitative analysis of the competitive scenario for region wise prominent countries. The market size and forecast for each region has been provided for the period from 2015 to 2025 along with the CAGR (%) for the forecast period from 2017 to 2025.